Today, Ismail Farouk gave us (my girlfriend, her father, who’s here in Jo’burg on a two week visit and myself) a walking tour of downtown Johannesburg. Downtown Jo’burg is -very- black. That is, you practically only see blacks walking the streets. You can imagine the funny looks we got: An Indian, a colored, a white girl and an undefined Caucasian. Funnily enough, my girlfriend, although she -looks- as white as they come, is very colored. We joked she could be wearing a t-shirt saying she’s 25% black, which she is. 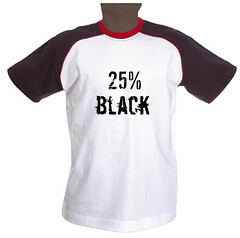 And in case you’re drunk or stupid, the t-shirt is of course, also about 25% black.